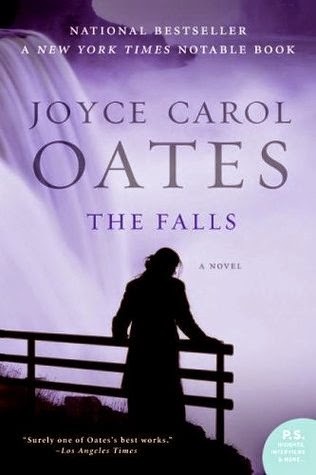 The novel, The Falls, opens with the suicide of a man on his honeymoon. This is the story of his bride, Ariah, and the life she leads after his death, her new family, their struggles, and their achievements. I was a little put off in the first 180 or so pages of the book, wondering if I should set it aside and move onto something more interesting; however, because I was reading the book for as a group read, I plodded along. I had a difficult time getting through the portions of the book devoted to Ariah and her thoughts. I did not care for her as a character through much of the book, I’m afraid. I felt some sympathy for all she had been through; however, her personality and quirks left me feeling irritated with her more than anything. By page 186, the book took an interesting turn and from that point on, I was lost in the pages, barely putting the book down until the very end. I was especially drawn to the story of the infamous Love Canal, which was only beginning to make headlines at the time period in which the book was set, and what was to follow after in the novel. Dirk Burnaby’s character was interesting, and I especially was drawn to his children and their stories about their search to know more about the man their father had been and to find out more about themselves. They were each very different and dealt with their childhood and early adulthood in their own ways. The author’s descriptions of Niagara Falls brought back memories of my trip to that part of the country several years ago, and I could almost picture myself there again. It would have been a mistake to set this book aside after the first 50 pages as so many fellow book readers advise. I would have missed out on a wonderful story that will stay with me for a long time to come. Melody - I am so glad I kept reading this one as it has stayed with me even today. I read it back at a time when I rarely gave up on books, and given it was a group read, I felt extra motivated to keep going. I'm not sure I would be so patient today. And in this case, that would have been a shame because I would have missed on on a wonderful book. Sandra - It is. I've given up on books having read fewer pages. A lot depends on the book and even why I am reading it. It's books like this that kept me reading to the end of many books I thought of giving up on because I hoped for a payoff at the end. I have several of her books on my shelves but haven't read Oates yet. It's good to know this one was worth it! Stacy - I haven't read anything else by her yet, but I have a few of her other books on my shelf to try. It is frustrating when a book is slow to catch your interest. I'm not sure I would have hung on for 186 pages...but then maybe I would for Joyce Carol Oates. Oates is one of those authors that I really feel like I should read at some point though that time has yet to come. I'm glad that you persevered and it definitely sounds like you were rewarded. I'm not sure I can read a book with a slow start right now but when I do get to this one (and it will happen!) I will remember to keep going. Great review! This book sounds like a good example of why I have a hard time setting a fast rule for when I give up on a book. So many people do that at page 50 or 100 but that is so often too soon!